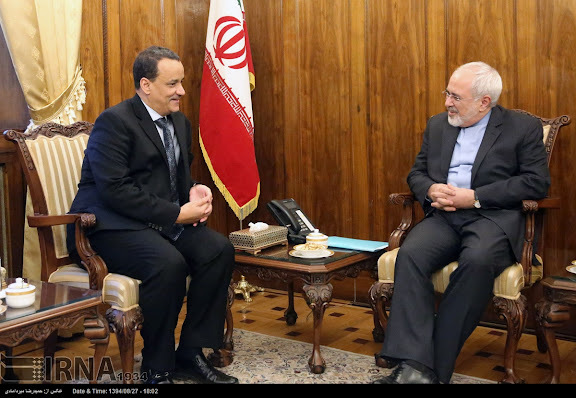 United Nations Special Envoy for Yemen Ismail Ould Cheikh Ahmed (L) with Iranian Foreign Minister Mohammad Javad Zarif (R) on 18NOV15 in Tehran. The UN Special Envoy is in Tehran for talks on the latest developments in Yemen. He is visiting Iran following his trips to Saudi Arabia and Oman. 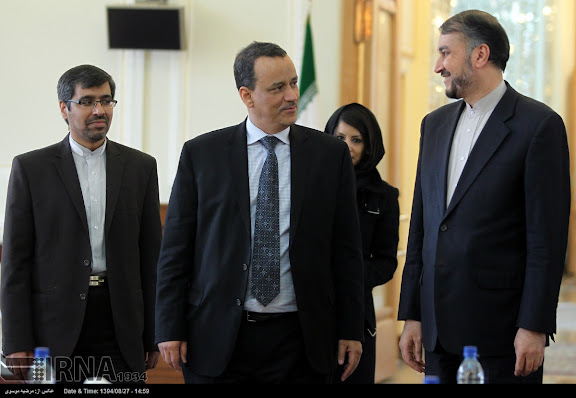 United Nations Special Envoy for Yemen Ismail Ould Cheikh Ahmed with IIranian Deputy Foreign Minister for Arab-African Affairs Hossein Amir Abdollahian (R1). 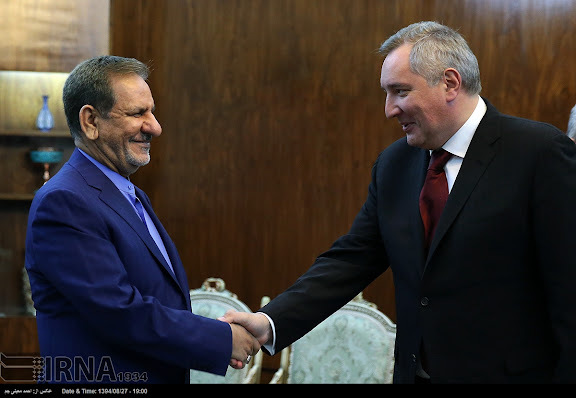 Iranian First Vice President Eshaq Jahangiri (L) with Dmitryi Olegovich Rogozin (R), Deputy Prime Minister of Russia, on 18NOV15 in Tehran. Rogozin's portfolio includes the Russian aerospace industry, shipbuilding, maritime operations, prevention and elimination of emergency situations, and the defense manufacturing sector. 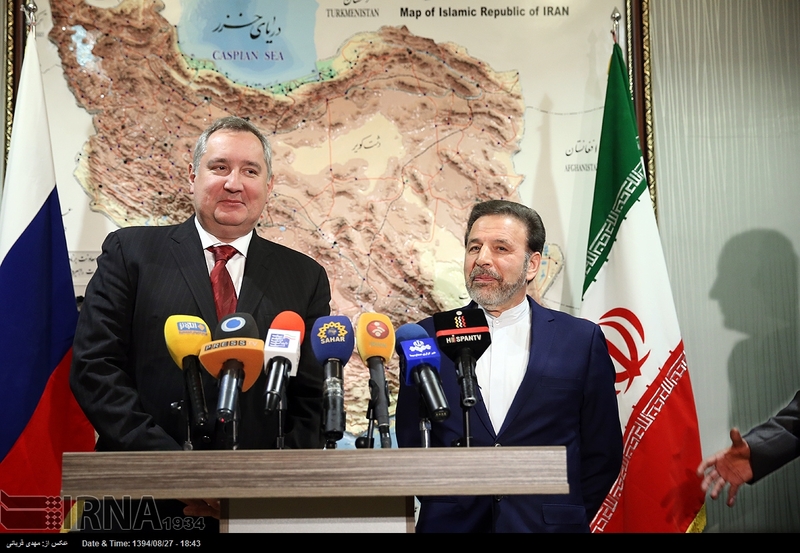 Russian Deputy Prime Minister Dmitryi Olegovich Rogozin (L) with Dr. Mahmoud Vaezi, Iranian Minister of Communications and Information Technology of Iran, on 18NOV15 in Tehran. Russia will be ready to go over to the partial localization of the Sukhoi Superjet 100 production in Iran, if Tehran takes a decision on purchasing ready-made aircraft, Russian Deputy Prime Minister Dmitry Rogozin who has completed a two-day visit to Iran told the Rossiya 24 TV channel. Iran and Russia have reached agreement on expanding cooperation in space research, Russian Deputy Prime Minister Dmitry Rogozin told TASS on Wednesday upon the end of talks with the Iranian Vice President in charge of science and technologies, Sorena Sattari. COMMENTARY: The Russians are interested in providing Iranian commercial applications with GLONASS system, as well as providing satellite launch services. It is ironic that Iran is allowing itself to be taken for a ride by Russia again!. Despite years of missed deadlines such as Bushehr power station at enormous cost and years late and the nonsense of S300 air defence system delivery for which Iran has already paid, Iran is prepared to trust Russia again! I think the whole thing boils down to Iran’s irrational behaviour towards West in general and US in particular. After 40 years of animosity towards US, they still want to linger on to the old and tired slogans. The price is not only economic but technology as well. They end up paying over the time to a second rate technology. The same goes for dealings with China. Moreover China is not only flooding Iran with junk goods, it is as yet not committed itself to any significant investment in Iran. Case in point their disastrous involvement in South Pars oil fields! Agreed that Russia and China give Iran only second and third rate military hardware. However, Iran has extensive history and experience receiving first rate military goods from the West, particularly the US. However, the price Iran had to pay was its sovereignty. Perhaps the leaders now prefer to settle for second rate military gear, while maintaining their independence in foreign policy. Remember, only so-called "allies" that tow the US line on foreign policy, like Israel, Egypt, Jordan and Saudi, receive high quality hardware. Some would argue the price is too high to pay. The Russians and Chinese, while definitely not out to promote Iran's interest, do not require total subservience from Iran. Well I am not sure it is any longer a question of independent or rather “irrational” foreign policy. Certainly in the field of non-military high tech, they can collaborate with Germans or Italians. Recall that Bushehr was originally a German project. The problem is that Iran wants to have it both ways. When it suits Iran, they want to deal with US and Boing. On the other hand they still want to maintain no relations with US. A country like Iran cannot have a totally independent foreign policy. It just does not have the industrial base and resources to be one. Indeed there is really no truly independent country in the world these days ad moreover IMO it does not make sense in 21st century. Clearly like most of the World a majority of Iranians want to live like any other people. The problem is the so called independence by the rulers in Iran at any cost. Surely North Korea is a shining example of this so called independence. Probably the most important issue is that, Iran by choice and preference is obsessed with anti-US and anti-Israel policy. Iran does not simply want to bridge a limited relations with the US or adopt a more neutral approach on the Arab-Israeli conflict. After all Iran is not an Arabic country. If we look around Iran’s neighbours, the only truly cordial relation that Iran has is with Armenia which is a Christian country. As a result, Iran has brought upon itself the unnecessary animosity of the West, which has led to Iran’s international isolation. Internally Iran has alienated a great majority of its own people with unnecessary obsession with Islam where many people feel trapped in an ideology that they cannot relate to and cannot make any connection to it. There is a difference between globalized interdependence in trade and arms transfers. Yes, Iran is relatively free to obtain non-military western tech. But when it comes to the country's security and independence, no proud Iranian government should or would negotiate. The point is that the US will not simply accept a "non-aligned" Iran. They want an Iran that's like Saudi or Egypt, a pawn. They want Iran to stop influencing other countries and trying to create a safer security environment for itself. They want an Iran that has no industry of its own so they can be passive buyers of American goods. And most of all, they want Iran to be completely dependent on the US for security and thus be able to control its foreign policy. This is unacceptable to most Iranians. I am afraid I have to agree to differ on the meaning of independence. There is clearly a distinction between an independent foreign policy and a dogmatic one. Iran chooses a dogmatic foreign policy as it suits its slogans, but crucially not its national interest. Because of this dogmatic anti-west obsession, Iran has chased after Russia, China, India, Venezuela, Cuba and other isolated nations to create a so-called anti-imperialist alliance without any success. There are few pragmatics in Iranian leadership that are open to dialogue. The rest within the Iranian establishment in particular the hardliners have not grasped the fact that it is 21st century not the Cold War era and states act not according to ideals but on the basis of their shifting national interests. Consequently, just about every country, from China and Russia, India and Turkey have used and abused Iran. After all, many elements within Iran have no commitment or loyalty to Iranian nationhood. They hardly even recognize such a thing as the nation of Iran. If they could they would have banned Nowrouz altogether. For them, what matters is the Islamic community and the 40 years old revolutionary goals that have failed miserably as most Islamic countries in the world want nothing to do with Iran’s revolutionary ideals. Agree that Iran's national interest would be better served by the pragmatists in government than some of the more dogmatic hardliners. However, there has been a nationalist streak in some aspects of Iranian foreign policy since the revolution, although other aspects of policy by some actors have definitely hurt the nation. I think this shows that the current government is not a monolithic entity, but there are rival factions within it with different goals and objectives. The country's national interests would be better served by one than the other.